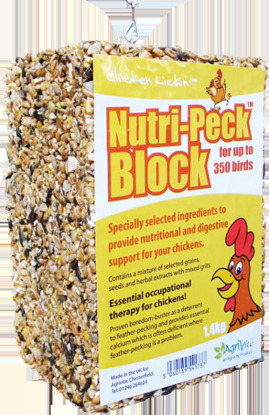 The Chicken Lickin' Nutri-Peck Block from Agrivite is a highly nutritious pecking block which contains a mixture of seed, grain, grits and herbal extract. It has been formulated to provide nutritional support and occupational therapy for chickens. Ideal as part of an anti-feather-pecking diet. There are currently no questions for Agrivite Chicken Lickin' Nutri-Peck Block - be the first to ask one!